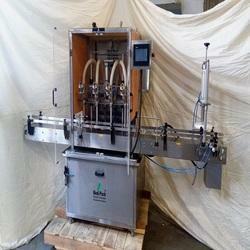 Automatic Volumetric Liquid Bottle Filling Machine work on volumetric principle with diving nozzles. The unit is made compact,versatile and enclosed in stainless steel elegantly matt finish body, of S.S Slat Conveyor, Reciprocating Nozzle with self-centering devices & SS Syringe. No container The main drive of the machine and conveyor drive consist of A/C Motor with synchronized variable A/c Frequency drive. Containers moving on S.S. Slat conveyor, feed below the filling nozzles through a settable twin pneumatically operated stopper system.The twin pneumatically operated stopper system and reciprocating nozzles can precisely match for centering of container below nozzles, to avoid spillage of liquid on container. To minimize foaming adjustable nozzle will reciprocate according to filling dose, nozzle will go upwards slowly from bottom level of bottle towards neck during filling. The dosing block with a hexagonal bolt fitted below syringes. This means fill size can be easily set. 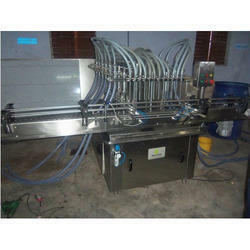 We offered Honey Filling Machine allows for easier handling of the operations as well as precise filling support for different range of liquids. Further, the bottles transmission process makes use of advanced clip bottleneck technology that avoids requirements of adjusting the equipment level. Some of its features include precision designed stainless steel bottle washing machine for lasting performance, high-speed large gravity flow valve for fat and accurate filling, advanced PLC automatic control technology, quality key electrical components for dependable services. We are an esteemed name in the concerned industry engaged in offering High speed Honey Filling Machine that work on volumetric principle with diving nozzles. This machine is versatile and enclosed in stainless steel elegantly matt finish body. The main drive of the machine and conveyor drive consist of A/C Motor with synchronized variable A/c Frequency drive. Offered machine is featured with inbuilt protection against over current, voltage fluctuation, short circuit in AC Frequency drive.